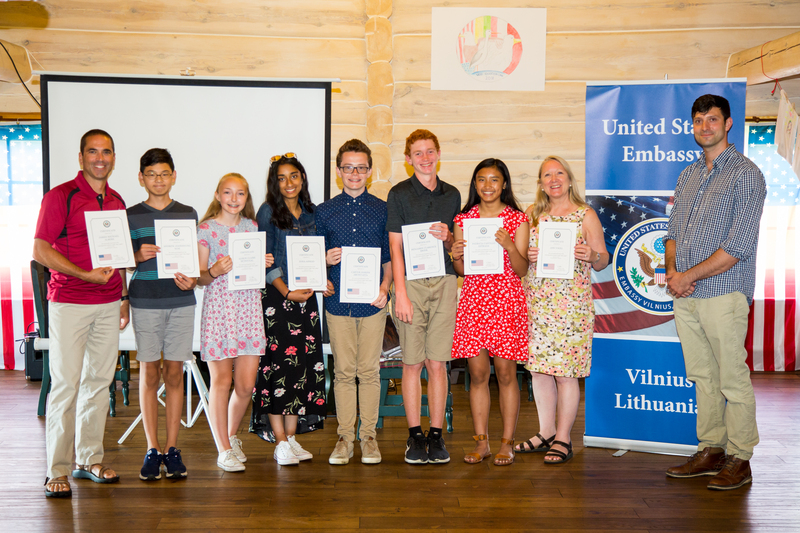 This past week, five rising ninth graders and one rising tenth grader represented the United States at a weeklong camp in Lithuania as guests of the US Embassy. 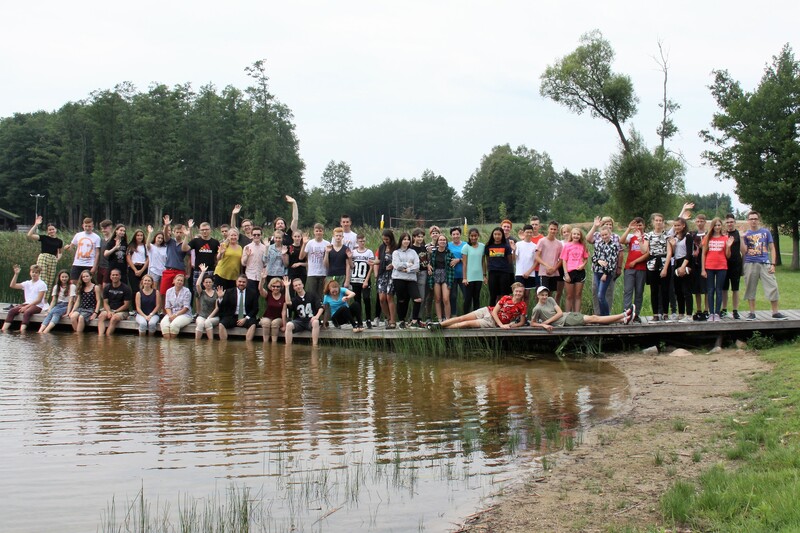 As the only Americans participating for the second year, our students lived in cabins with 36 Lithuanian students from throughout the country and with six students from our sister school in Poland. They attended courses and activities designed to build cultural literacy, international friendships, and understanding of universal human rights and responsibilities, democratic values, and vital organizations working toward these goals such as NATO, UNESCO, and Doctors without Borders. The overall purpose of the camp is to reinforce democratic values in this Baltic country that, from 1944 until 1991, was Soviet-occupied. Now a member of NATO and the EU, Lithuania is becoming more western-facing, intent on keeping its independence and strengthening its democracy, a goal shared by the United States. 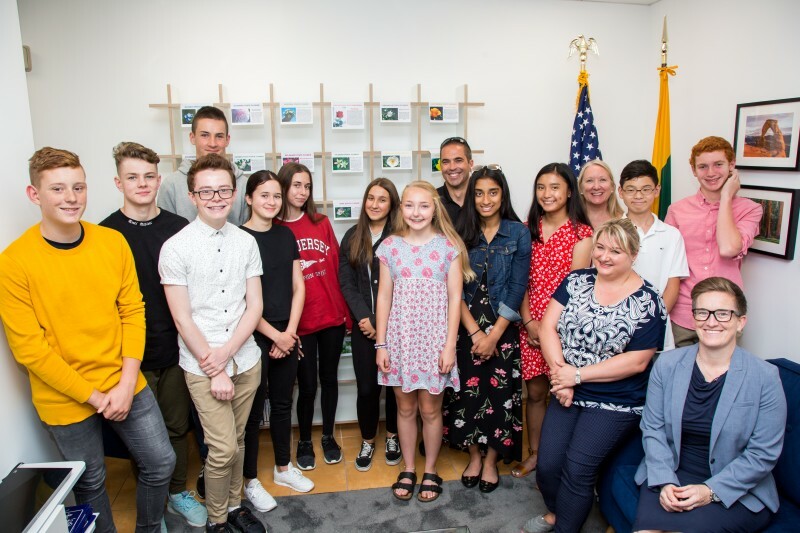 The week started with a briefing at the US Embassy for our students and the delegation from our sister school in Swidnik, Poland. We met with the acting ambassador, Howard Solomon, and other diplomats including Cultural Affairs Officers and the Political Affairs Officer, some of whom also visited the camp to speak in more detail. The acting ambassador is a scholar and expert on Russia and has spent more time posted in that country than any other diplomat, so his comments were especially interesting as they occurred while President Trump was in Helsinki. Other diplomats spoke about topics such as their careers in the Foreign Service, opportunities for young people to take advantage of various State Department programs, and the need for speakers of specific target languages. All recommended students pursue a liberal arts education, become “news junkies,” focus on becoming critical readers, writers, and thinkers, and pursue whatever passion they have because foreign service work needs people with many areas of expertise, from business managers and human resource experts to keep the embassies running to communications specialists to political science and history experts, and to country- or region-specific experts. All diplomats emphasized the importance of being able to research, read, synthesize, and analyze vast quantities of information, and write succinct summaries of it for specific audiences and to take opportunities for engaging with people from throughout the world. We all agreed this is precisely the education CWA provides. After the briefing at the Embassy, CWA students, teacher Jim Albers, and I journeyed to the countryside campsite with the other school delegations. 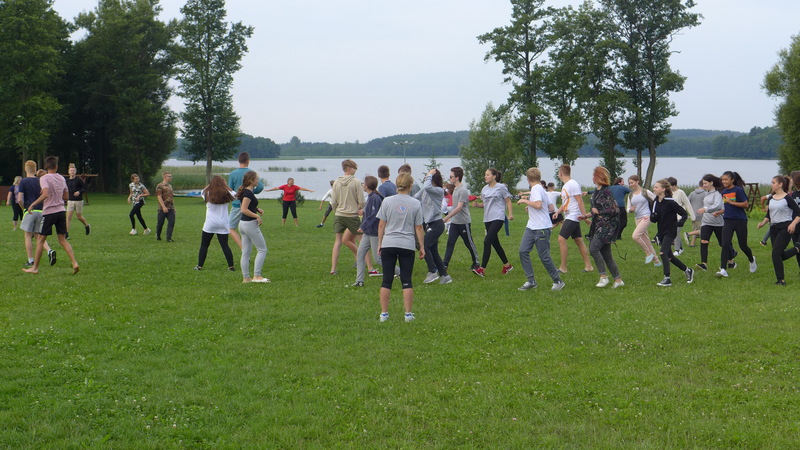 The teachers from Lithuania and Poland had met earlier in the spring to organize the lessons and activities which filled the day beginning with a roving bagpipe player performing wake-up music at each cabin followed by “gymnastics,” outdoor exercises and games. CWA added fun to the mornings by teaching games such as Princess and Ninja. The days were filled with theme-based activities and speakers from the US Embassy. Some Fulbright scholar alumni also visited to present on their areas of research such as the need for worldwide vaccinations. Prior to the camp, the CWA group had the pleasure of meeting our new Lithuanian 11th grader, Jocubas, and his mother. They spent the day with us, joined us for a Neris River cruise on a Baltic Viking river boat, and accompanied us as we visited the Museum of Occupations and Freedom Fighters (located in a former building used by the KGB), strolled through sites in the old town, visited other historic areas, and enjoyed a traditional Lithuanian lunch. They were generous in sharing stories about Vilnius and their live there and expressed their excitement about Jocubas (who might have us call him Jacob) joining CWA for the 2018-19 school year. When I was on the bus to camp I was so nervous that people wouldn’t be friendly, they wouldn’t talk to me, etc. but from the first day of camp, everybody was incredibly kind and interesting, and I made great friends. While the camp was about values and how democracies work and using our power, I believe that the exchange of cultures and the interactions with new people were the impactful experiences to me. Most of the people that I met at camp I will never see again but they left a mark on me and I won’t forget them for a long time. I almost never cry at the end of things; when I moved I didn’t cry, and not when I graduated [from middle school], but at the end of camp, I cried. I cried because I knew that I couldn’t express in words how much these people meant to me and I wouldn’t get another chance to explain that to them. I also want to thank Ms. Vogel and Mr. Albers for traveling halfway across the world with us and helping us acclimate to the culture and the people of Lithuania. Finally, I want to say thank you to CWA for making this possible. Charles Wright set all of this up and allowed us to do things that I couldn’t do at any other school. Going to this camp was a once in a lifetime experience and I wish I could have stayed even longer! The trip to Lithuania was an amazing experience. I am extremely thankful for this great opportunity to meet peers from across the world and learn more about the beauty and importance of democracy. I am tremendously grateful to the school, the US Embassy, and my parents to send us on such an unforgettable experience. The speakers from the US Embassy gave enthralling presentations, where I learned about philosophy, the importance of vaccinations, and jobs at the embassy. In addition, I really enjoyed the activities, as they gave us a chance to debate and share our opinions. The activities assisted in creating bonds with the Poles and Lithuanians because they all had the element of teamwork. 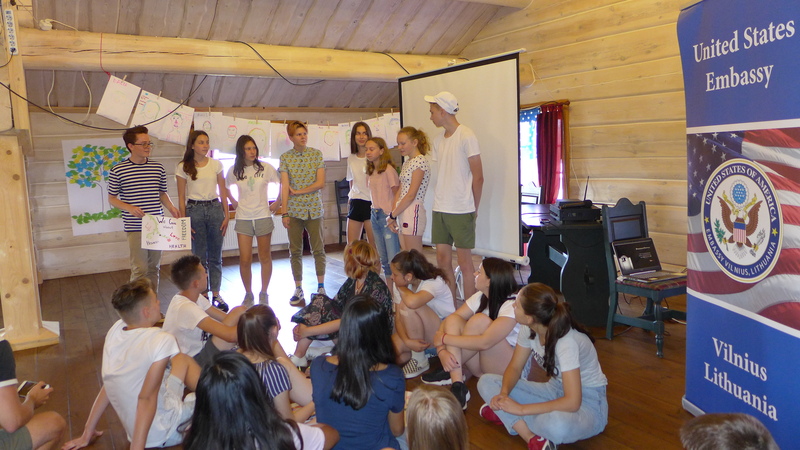 The other students from Poland and Lithuania were fantastic, as their kindness, creativity, and acceptance allowed a very enjoyable camp experience. This incredible opportunity to travel to Lithuania for ten days felt much shorter because of the amazing time I had. The camp began with all of the students acting partially shy and uncomfortable about speaking to someone from the different cultures, but we were almost immediately overwhelmed with curiosity and myriad conversation. From every interaction I had with the students and teachers from Lithuania and Poland, I learned so much that I know I will keep forever. Everyone emitted a sense of compassion and appreciation for everything discussed at camp that it was intoxicating. All of us humans from many different places with different upbringings were sitting together to talk about what makes the world awesome. We all shared very openly our political opinions, values, wants, dreams, the importance of tolerance, and so much more as the instructors gave us the responsibility of talking about democracy, its importance, and how it improves the lives of everybody it touches. We also talked of the impacts and roles international organizations such as NATO and the United Nations have on the world and its wellbeing. Over the course of the entire trip, I was able to reinforce the idea that we are all human beings on a planet drifting through space who, in the end, are just looking for peace and happiness despite the differences we might have on the outside. Wow. I enjoyed every second of this trip and gained so, so much from the camp as a whole. It was incredibly eye-opening to be surrounded by new languages and to be immersed in a new culture. It was also heartwarming to see each camper make strong, priceless connections in less than a week at the camp. I gained confidence in myself and in the knowledge that I acquired including that of core values, environmental safety, responsibilities, democracy and so much more. 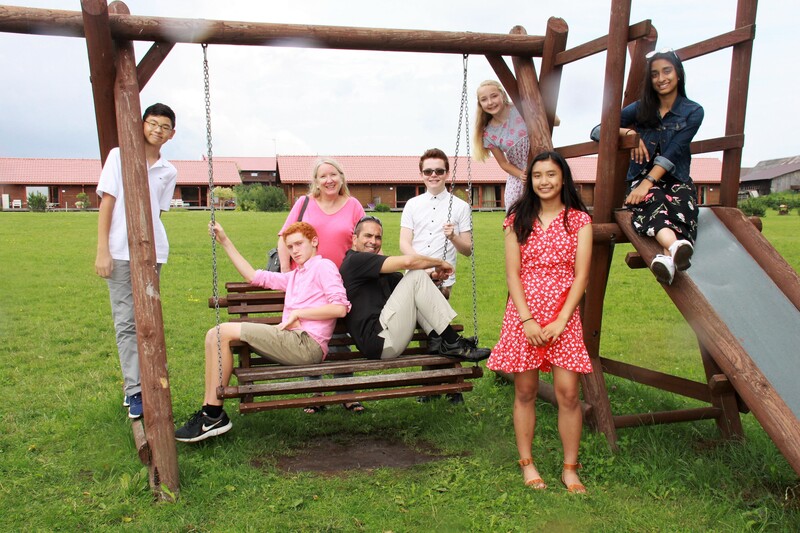 It was both a challenging and fun experience as we, being the only American school, were questioned heavily by the students from both Poland and Lithuania on a variety of topics. The rich culture brought to the camp was shared by each and every student and teacher. I wish more students had the same opportunity to experience different cultures as well as feel comfortable questioning what their lives consist of. I loved talking with the US Embassy diplomats and learning more about what it takes to work as a diplomat as this is something I could see myself being a part of. I am beyond thankful for the opportunity and would do it again in a heartbeat. This experience was life-changing. It was my first time traveling to Europe, and I can say it has definitely set a high bar for future visits to Europe. I learned about so much at the camp, from human rights to core values, to other countries and their governments. We got hours upon hours of hands-on interactive education, and practice in public speaking and creativity. The classes helped us improve our confidence, fluency in presentation, and our ability to dig deep into every topic. The classes weren’t the only learning experience, since we were spending our whole days with Lithuanian and Polish students. They were highly interested about our culture, and they asked us about everything from our everyday lives to politics in our country. It was interesting to see differences and similarities in each other’s cultures, whether we were talking about language, food, or trends. Everyone at camp quickly grew close to each other, so when it was time to leave, every single one of the campers was having a hard time saying goodbye. Overall, this camp was more than amazing, and I would definitely look forward to partaking in camps/experiences like this in the future. I’m unbelievably grateful that I had the opportunity to attend this camp. Meeting with various people from the US Embassy was eye opening and really showed me how hard our government works to create long term alliances and forward democracy. Additionally, upon meeting the Lithuanians and Poles I realized how much the various countries of our world look up to the US. The friends I made were constantly asking questions about life in the US, our country’s impressive history, and our current politics. Likewise, I was interested to learn the old rich history of the countries of the Baltic region and how they felt about their countries progress. 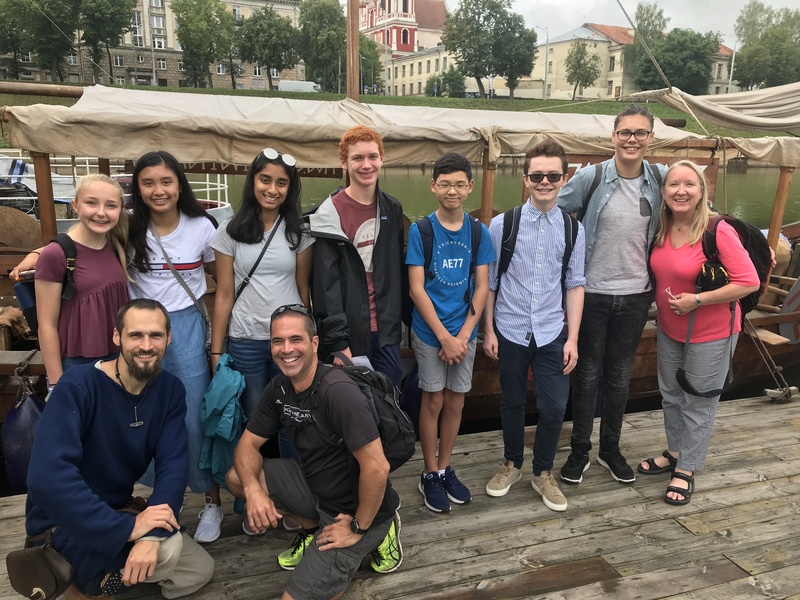 I also learned that both the Lithuanians and Polish students’ values were very similar to our own and the connections we formed allowed me to learn more about their culture and heritage than I could ever learn in a classroom. Apart from all of this, I felt like I grew more confident and experienced as many of the other students continually looked up to us. As the week passed, we all became so much closer and by Saturday, nobody wanted to leave. Even now, we’re continuing to communicate through social media and we’ve all made friends for life. I’m even hoping to host a new friend this year for Global Summit and maybe visit Poland soon. To conclude, I feel like this camp was one of the most thought-provoking and life-changing experiences for me. I’m so glad I went and hope that I have the opportunity to participate in something of the like again.